Love locks at N’Seoul Tower. Couples write their names and a small message on the lock, attach it to the fence and throw away the key. With Valentine’s Day only a day away, I thought it’d be fitting to write a post about it. I mean, you can’t even walk five feet down the street without being reminded about it. It’s a day couples look forward to and singles hate. And it doesn’t matter where you’re from, that sentiment seems to be consistent from country to country. I’m always intrigued how holidays can differ around the world, and in Korea, things happen slightly differently on Valentine’s Day. The major difference? There’s no exchanging of presents between partners, only women giving men chocolate. While there are stuffed bears and such, chocolate is the main gift given. Even stationary stores get in on the action, dedicating entire aisles to making your own chocolates with various molds, sprinkles, and bags with bows to serve them up in. Hey, at least if you want, you can customize your gift. So where’s the love for the women you may be asking? That comes exactly one month later on March 14th, aka White Day. On that day, it’s the man’s turn to shower their special lady with candy, and not chocolate this time around. Unfortunately, us ladies have to wait a month to be wined and dined, but I suppose since we’re giving our gifts first, we can set the bar high. Being in a relationship in Korea comes with it’s own holiday calendar. Believe it or not, couples celebrate something different on the 14th of every month! January 14: Diary Day. The day of presenting your lover with a cute diary and a basket of flowers. February 14: Valentine’s Day. The day when girls and women present their boyfriends and husbands with chocolate and confess their love. March 14: White Day. The day when boys and men present their girlfriends and wives with candy and confess their love. April 14th is for singles only! May 14: Rose Day. Lovers present each other with roses to express their love. June 14: Kiss Day. Lovers kiss to confirm their love. July 14: Silver Day. Lovers exchange silver rings to make a promise for the future. August 14: Music Day. The day of presenting a CD with love songs.
. Lovers take pictures to keep memories of their love. October 14: Wine Day . The day when lovers drink wine, (though I wonder what the underage kids do). November 14: Movie Day. Lovers go to see a movie together holding hands. December 14: Money Day. The day of spending generously on your lover. And on top of all those dates are special anniversary days; 100, 200, 500 and 1000 day anniversaries. Phew, did you get all that?! 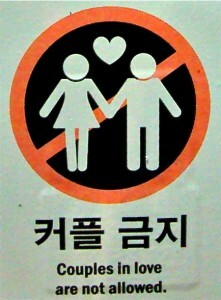 Being in a relationship can be a rather large undertaking in Korea, specifically for men. Financially, the man is expected to cover much of the costs. But money aside, there are two major differences I noticed about couples in Korea compared to their western counterparts. Firstly, couples like to be all matchy-matchy. They take coordinated outfits to a whole new level! I’m talking about wearing the exact. same. outfit. I kid you not. We’ve seen it in the streets, on the beach, and even on the ski slopes! Wearing matching outfits announces to the world that you are taken and your partner is too. So if you’re going to hit on a girl or guy at a bar, take a moment and scan around the room to see if anyone is wearing the exact same thing. Tristan and I didn’t exactly jump at the chance to embrace this trend while we were living in Korea. The closest we allowed ourselves to come was matching TV shirts. This is as comfortable as we’ll get with coordinated outfits. So back to Valentine’s Day, Tristan and I don’t really “celebrate” it. Personally I’d like to think every day should be Valentine’s Day, though I know it’s not. But I don’t exactly need a day to dictate that my man give me flowers and tell me how much he loves me. I know how much he loves me. And he knows how much I love him. But what I do love about Valentine’s Day is that extra spring in everyone’s step and the smiles on people’s faces. And even though you may not have a “special someone” to celebrate it with, doesn’t mean you aren’t loved. Maybe we should rename the day to something more appropriate.